Icons are lovely objects – directing our hearts towards God – sometimes miraculous and truly “windows to heaven.” But I want to be somewhat theological today and write about the “truth” of an icon. 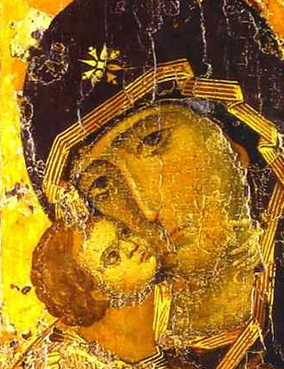 Icons are peculiar, when painted according to the most traditional patterns. They are not just “ahistorical” they are positively non-historical. We can look at an icon and see any number of events depicted that do not belong to the same time framework at all. Icons are simply not about history as we popularly understand it. This separates them dramatically from much that flowered in the Western Renaissance. Thus we have this rather strange aspect of icons. They are eschatological representations. They not only show us what happened (if we’re talking about a Biblical scene) but also show us what that scene means in its fullest and final sense. Saints are not painted as they might have appeared in life, but in an eschatological fashion representing how they shall be in the age to come (at least this is what the intention is behind many stylistic aspects of an icon). They are thin (not heavy and of the earth); their senses are either deemphasized (small ears, small mouth, thin and elongated hands) because they are turned inward to the heart; or overemphasized (large eyes and enlarged forehead) representing heavenly vision and wisdom. They are always presented to us face-to-face, never in profile, for the truth of who they are is only to be known personally (hypostatically) in relationsip, never as a merely existing object. This last aspect is quite notable in the resurrection appearances of Christ. He cannot be objectified. In the Seventh Council, the Fathers said, “Icons do with color what Scripture does with words.” And so it should not be surprising to find that the Scriptures themselves only open their Truth to us eschatologically. St. John’s gospel is probably the most obvious in this respect. He places Christ’s discourse on the meaning of the Eucharist at the occasion of the feeding of the five thousand, and yet does not have an account of the Last Supper in the Passion Narrative (or at least does not include the Eucharist in his account of the Last Supper as do Matthew and Luke). Christ makes statements in his sermon following the feeding of the five thousand that would and will make sense only to those who are eucharistically aware. It is a sermon out of time. All of the New Testament is written from a “future” perspective – it’s all after the fact – Christ having been raised and taught the Church and ascended into Heaven. The Holy Spirit has already come. Indeed, the Scriptures of the Old Testament are now seen as fulfilled in Christ. Thus, they will only yield up the “truth” of their meaning by examining them through Christ. This is also true of our own lives as Christians, as well as the corporate life of the Church. The meal of which we partake together is Christ’s Body and Blood, the Messianic Banquet. It is food from the end of the world. Thus in St. John Chrysostom’s Liturgy, we actually speak of the Second Coming in the past tense. St. John says the same thing: “Beloved, we are God’s children now; it does not yet appear what we shall be, but we know that when he appears we shall be like him, for we shall see him as he is” (1John 3:2). Thus the icons of the Church stand around us not as reminders of the past, but as witnesses of the age to come. They say to us: “Thus shall you be.” And we ourselves groan within for such truth, as the Scriptures tell us, “Looking to Christ, the author and the finisher of our faith” (Heb. 12:2). 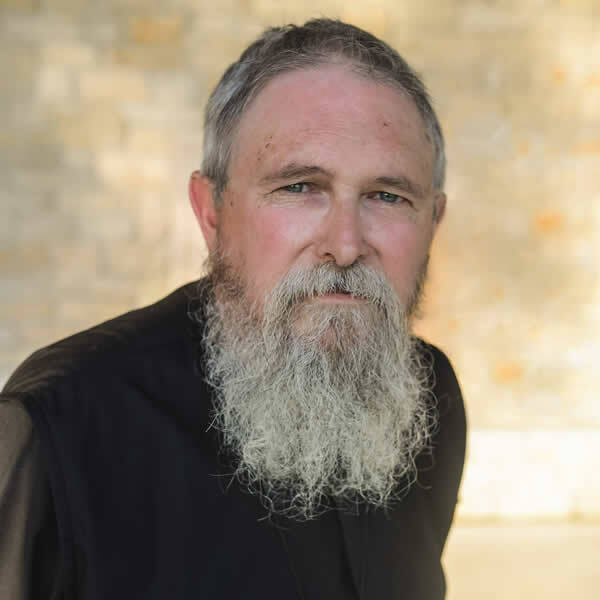 An outstanding and out of time posting Father Stephen — many years to you! As an Episcopalian, my meager grasp of icons has come from Dr. Rowan Williams’s book, The Dwelling of the Light: Praying with Icons of Christ. Have any of you Orthodox brothers or sisters read this? Is it on the mark? Dear Father, bless! The above is one of the things that became the most immediately obvious to me about the use and presence of Icons in the Church and one of the things for which I am also the most grateful. It is one thing to know in the abstract that God is omnipresent, that we are surrounded by a cloud of witnesses, etc. It is quite another to experience it, and Icons are a very great help in making the latter possible and in also making us more aware of what kind of God it is Who is omnipresent, etc. Father, I loved the thought about speaking of the second coming in the past tense. I had never noticed that before. The coming of the Parakletos at Pentecost was a kind of second coming. Also, this is very reminiscent of G.B. Caird’s “three tenses of salvation” as outlined in his hard-to-find New Testament Theology. For those of you who know who N.T. Wright is, pretty much all his big ideas (though not the bad ones!) are taken from Caird, who was his tutor at Oxford. Caird’s Language and Imagery of the Bible would also interest you folks, I think. Profoundly wonderful thoughts. I have been an Orthodox Christian for only a little over a year, the Icons fill my heart and you explained why. Thank you. Growing up surrounded by icons I appreciate the experience of iconography, which differs from the *theology* of icons. The experience of icons is felt in homes and churches, and in seeing the image of Christ in those around us. Icons are light and color to Scripture; they are two parts emotion and one part theology. Intellectual explanations have a place, but icons as tools for theology are misunderstood. My study of icons is limited, but my experience covers a lifetime – If you focus on the study, you may just miss the experience. Joy and wonder is a gift indeed. What if these very same Saints are painted as they actually are in real Life, but from a Heavenly perspective, and if we painted each other what would we see? Heart and Heaven simultaneously and could we bear to paint that…Christ [active] in us the Hope of Glory? I really appreciated your thoughts on the eschatological nature of iconography. Often people find icons strange-looking or even unsettling precisely because they don’t understand the “truth” of icons as you put it. We see only the physical, and rarely get a glimpse into the spiritual. By expressing both the physical and the spiritual, both the temporal and the eternal, icons are more real than our perceived reality is. But because so many people do not have the eyes to see this, they pass of icons as primitive or stylized representations. It should not surprise us, though, when so many professed Christians find it impossible to believe that bread and wine can be the very body and blood of Christ. So many of us lack the eyes of faith and rely only on reason and logic. I think that the eschatological character of icons is perhaps one of the most essential characteristics in understanding them. In fact, I probably think that about the whole of the Christian faith. The Second Vatican Council gave the Church a vernacular Liturgy but the nuances of the Eastern Church are so subtle they might easily be missed. “Individuals’ pray without regard to syntax and the type of print” says R.E.S. Tanner, but look for “adjustable semantic spanners” when possible alternative meanings remain undefined. (The Inequality of Unwritten Languages, 2004, p. 67). I am struck by Met. KALLISTOS’ statement that the Church is a faithful and true icon of the Holy Trinity (The Orthodox Church, 1997, p. 240). This is a great observation Jerry. I would say that Eschatology starts at the Cross and ripples outwards – Saints are caught up in the pneumatological ripples and the energies rippling through them – triggering the changes and that is what the Iconographers are stiving to paint. Jerry you are so right here. The great irony is that the Pascha of Christ has completely crushed the head of the serpent of old (cf. 1 Cor. 15:55). “St John Chrysostom’s Paschal homily, goes back to St Gregory of Nyssa’s theory of how God deceived the devil, having hidden the ‘hook’ of His divinity under the guise of His human nature. By swallowing the bait, Hades also swallowed the ‘hook’ that destroyed it from within. 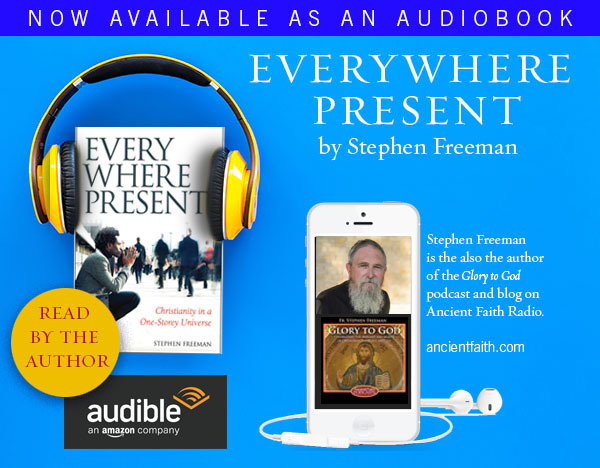 In this there are overtones to Jonah’s episode in the belly of the whale, which itself points to Christ’s Pascha as the out-of-time event that intersects all time — in Fr. Stephen’s wonderful phraseology. Pingback: Icons « Jeremiah Was A Bullfrog… Now He's Eastern Orthodox?